When I first saw this month's challenge, I wasn't quite sure what to think. When I think of pate, I think of liver, and that is not very appetizing to me. I think about my grandfather ordering steaming plates of liver and onions and happy hour at my other grandparent's club where the star dish was chopped liver. Needless to say, I was very happy to see the vegetarian choice on the recipe list! I have also been trying to bake more breads at home and this was a perfect opportunity to try out a new recipe. (great step by step guide here). I started both recipes on Saturday afternoon and finished them up on Sunday. Right now I'm enjoying the results while I flip between the Tony's, the Celtics, and blogging. I assembled all the ingredients for each layer, prepped my new red loaf pan, and got to work. For the bean layer I opted for fresh oregano. Oregano is not really one of my favorite flavors and I especially do not like dried oregano. I also mashed and blended by hand - in the past when I've used the food processor the mixture has become too liquidy. Not too much too report on the red pepper layer - just dump and pulse! For the pesto, it was also pretty straightforward. I toasted the pine nuts in the toaster on the light toast setting. 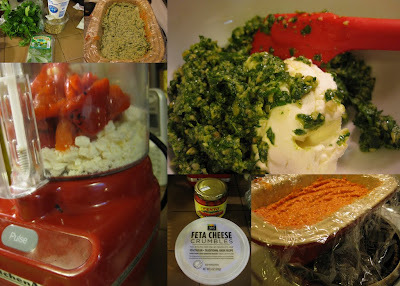 All the ingredients went into the quickly washed food processor and pulsed and processed until I had a pesto. As a creative touch, I decided to put a lemon slice and some oregano leaves in the bottom of the loaf pan for decoration. After making sure the layers were even and the loaf was tightly wrapped with plastic wrap, the loaf went into the refrigerator to chill overnight. Twenty-four hours of chilling later and 30 minutes in the freezer later, the loaf was ready to unmold. Now on to the baguette before I finish the story of the pate. I started the baguette before working on the pate. Mixing up the starter was easy - though it did call for one of the only kitchen utensils I don't have (1/16 teaspoon measuring spoon). I whisked together the yeast, water, and flour and left it on the counter to work its magic while I headed out to a sorority alumni event. When I woke up this morning I was happy to see that my starter looked like the starter in the King Arthur Flour baking blog. After a quick breakfast with farm fresh eggs from Smith's Country Cheese and uber wheat toast from B&R Artisan Breads, I started on the next steps for the baguettes. I dumped the starter, salt, and flour into my trusty red KitchenAid mixer bowl and whisked the yeast and water in the empty starter bowl. Then it was all in to the mixer for 5 minutes of kneading. Now the waiting. I planned to be home all day so I could check on my dough almost hourly. 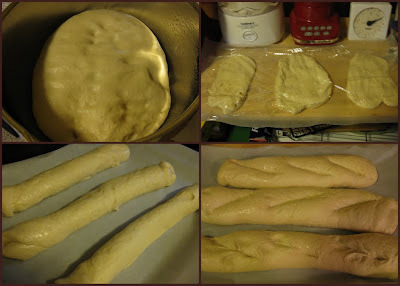 Here's a few looks at the bread during the 5ish hour rising process. Having no AC and warmish day was helpful to the dough during the process. After rising, gently deflating, rising, gently deflating, dividing, flattening, folding, and more rising the baguettes were ready for the oven! I followed the tip to spritz the dough with warm water to create a crispy crackly crust. After 25 minutes the baguettes were golden brown, crispy and maybe just a little too dark on the bottom (almost, but not quite burned). Now the fun part - putting it all together! I took the loaf out of the freezer and decided on using my cake stand for a dramatic presentation. I sliced up one of the baguettes and flipped the pate. Success! It stood up on the plate (don't mind my off-center decoration)! Now for the review.... The flavors are great. Although as I sit here snacking, it does taste much better at room temperature (as opposed to ice cold right out of the mold). I also thought that the bean layer was way too big relative to the other two layers. I think next time I would put a smaller layer of beans on the top, then the pepper and pesto, and beans on the bottom. That would also give it a more stable base. The baguettes are fabulous! We have already polished off one of the three and the others aren't going to be around for long. Even though it was a 24+ hour recipe, it was worth it! Thanks to the Daring Kitchen ladies for picking such a fun challenge! I am going to make this pate for our 4th of July potluck, it is exactly the type of recipe I was hoping to find! The bread looks delicious--very impressive! The presentation is beautiful.